Tehran bookstores have recently added a new volume to their arts section: Conceptual Art, an introduction to the art movement by British author Paul Wood, translated into Persian by Media Farzin, and published by Iranian Art Publishing. What follows is an email exchange between myself and the translator, who received her BA in painting from <?xml:namespace prefix = st1 ns = "urn:schemas-microsoft-com:office:smarttags" />Tehran University and is currently an MA student in Modern Art History at Columbia University, New York. M.F. : I’d like to thank you for your interest in the book, and for arranging this interview. I’m very happy that Conceptual Art has finally been published. 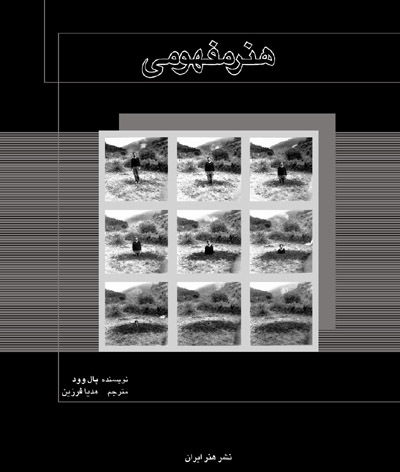 I was an art student at Tehran University in 2003, and translated this book to fulfill my BA thesis requirements. I was confused by the widespread use of the term “conceptual” among Iranian artists, and felt we all needed a textbook of sorts. The book is a small introduction to the Conceptual Art movement, published by the Tate Modern as part of a series on modern art. You may remember the two exhibitions of “Iranian Conceptual Art” at the Tehran Museum of Contemporary Art in 2001 and 2002. There was suddenly a burst of installation art in Tehran galleries; artists were using the term “conceptual” like it was going out of style. (Ironically, it had gone out of style.) But there was great freedom in breaking away from outdated categorizations: some of the work was smarter and more exciting than anything we then knew as Art; and a lot of it was weak, derivative and incommunicative. I was interested in defining the term, and this book helped me understand its history: as a largely Anglo-American development which began in the 1960s, introduced language into visual art, and declared that there was no need to produce an object in order to make “art”. P.A. : Tell us briefly that about previous books on visual arts which have been already published in Persian, and what you think of them. M.F. : I don’t think I’m familiar with all the books on contemporary art available in Iran today. I didn’t find anything in Persian that addressed the Conceptual movement while I was doing my research in 2002-03, nothing like a definitive introduction to modern art. I had been trained to use Jansen and Gardner as sources, and they certainly didn’t cover the type of art that I was interested in. It’s encouraging to see the large number of books and translations published in Iran every year, especially on theory and philosophy, but I don’t think Iranian scholars have access to the important art historians and critics of the 20th century. P.A. : Is the book intended for an audience beyond the immediate art world? Or is it just for art students? M.F. : I’m not sure who that larger audience might be. I tried to make my text clear to a reader unfamiliar with the work or the artists, but I doubt that it will be picked up anyone who doesn’t have some grounding in art history. I hope university students are able to use it as an introduction to the important figures of the movement, as a point of departure for further research. P.A. : How do you assess the current situation of visual arts in Persia (Iran)? M.F. : I’m really not qualified to assess the entire situation. I can perhaps speak of a small group of artists in Tehran whom I knew, worked with and admired. I think there is a lot of energy, a lot of talent, and a lot of work being produced. But one thing is for sure: young artists are terribly uneducated. I don’t mean just the history, although that’s extremely important—I also mean critical exchange: it takes many seminar classes, many studio visits, and a lot of patient experimentation to become an articulate artist. It also takes freedom and financial support to produce work that is confident of its stance and pushes the boundaries. There are many talented artists, but they are not sustained by a market, by critical voices, or by a substantial art community. P.A. : Are you going to translate more books in this field? M.F. : My views on art and art scholarship have changed a great deal in the past two years. I’d change a lot of what I wrote if I were to translate the same book today. I feel confident enough to do original research now, and hopefully my next project will be writing and not translating. Though I would like to use my experiences to make more texts available in Iran, it depends on finding the time and the right book.